For all the NASCAR fans out there, Avondale, AZ is the place to live. Home to the Phoenix International Raceway, Avondale is adjacent to Phoenix and offers residents plenty of fun activities, beautiful homes, and commercial opportunities. If you’re moving into or from Avondale, out of the city or internationally, let the professional Avondale, AZ movers at Muscular Moving Men make your move a complete success. Our full-service team is dedicated to providing excellent customer service to all our clients. We handle the move, so you can stay out of that hot Arizona sun and let the professionals handle the job. Check out how Muscular Moving Men can make sure your move is successful.We’re ready to take your call. Local moving is just one service the MMM provides. 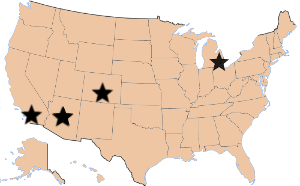 Our team also relocates clients in and out of the state with long distance moving service. Muscular Moving Men is your best choice for Avondale, AZ movers. Our professionals are ready to help you at every stage of your move. We provide packing services, so you don’t have to spend time packing your home. We’ll ensure your belongings arrive safely at your new home, and we’ll even help you store your belongings if needed. The moving cost of local Avondale, AZ movers depends on several factors. Muscular Moving Men bases its moving costs on the services required (loading/unloading, packing, storing), the amount that must be moved, and the total distance. When calling for a moving estimate, be sure to have a list of items being moved and know if you will need packing or storage. Local moves are calculated based on hourly rates so the proper crew size and number of trucks will depend on what you need moved. To get a better idea of the cost for our Avondale, AZ movers, contact Muscular Moving Men for a free quote. We’ll help you create a moving plan and prepare for your move. Call us at 602-923-6400 today.